SAILKARMA.COM - Sailing News, Videos and Photos! : Paul Cayard on "Farr 40 Pre-Worlds"
The Farr 40 fleet has reconvened in Miami for the World Championship which will begin Wednesday April 16, 2008. A preliminary regatta, "Pre-Worlds", starts Friday April 11. 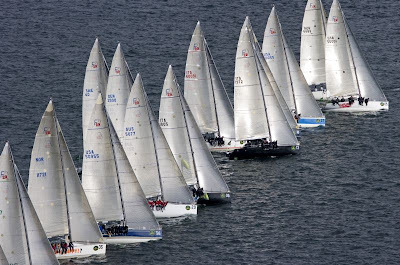 There will be 33 boats racing for the 11th World Championship in this class. As you have gathered from my reports earlier this year from Key West and Miami in March, the fleet is very competitive. There are past World Champions here, Olympics medalists as tacticians, American's Cup teams, Whitbread winners, etc. The field is deep and everyone will have good days and tough days. Coming back from a disappointing race will be a virtue that the winner will certainly possess. The Official site for the event is http://www.farr40worlds.com/ The event sponsor is one of my favorites, Rolex. We will race 16 races over the next week, that is 32 windward mark roundings... plenty of actions there when most of the 33 boats arrive at the same time.